I don’t know what it is about starting a healthy eating routine but around about the second week I always start to get carb cravings. This time has been no different. The first week of green smoothies and steamed fish and veggies was easy sailing and then half way through this week all I could think about were potatoes. I don’t even eat that many potatoes when I am not counting my calories so I am not sure why my cravings go that path but sure enough I found myself fighting the urge to bust my diet and buy some fast food fries. Luckily, I was able to take a deep breath and count to ten without the intoxicating aroma of fresh french fries to sway me from my path. Instead, I reached into my bag of healthy eating culinary tips and remembered my recipe for low fat Moroccan inspired baked potato slices. They aren’t fries but they have worked for me throughout the years because they are a way of getting a tasty potato dish on my plate without having to swap unhealthy for bland. Also, the recipe is incredibly flexible. If you don’t like Moroccan style spices then just use your own combination of spices and create your own version of the basic recipe. Meanwhile, slice the potatoes into fairly thin but not ultra thin slices. I usually aim to make them about half the width of my fingernail. Leave the skin on for extra goodness and taste. In a large bowl combine the oil, the spices, the lemon juice and zest. Mince your garlic and also put that in the bowl. However, I suggest actually grating your peeled garlic into the bowl. I use a microplane grater for this and I think it gives the garlic more punch in the mix. Put the potato slices into the bowl and mix everything around so that all of the slices get well coated. Line a baking tray with foil (I do this even with my non-stick trays to ensure easy cleanup) and transfer the slices to the tray. Put in the oven and bake for about 30 to 35 minutes or until they start to go golden brown. 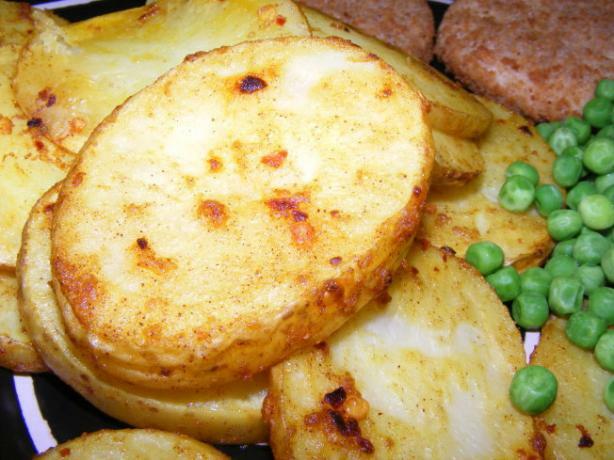 This entry was posted in Home Cooking and tagged Healthy, Low Fat, Potatoes, Vegetarian. Bookmark the permalink.